According to just about everybody, Teddy Kennedy represented the “soul” of the Democratic party, which presumably refers to his long-professed concern the poor and the weak. Now that that soul is safely buried, the Dems can move on to the important stuff, like preserving Wall Street power and escalating the war in Afghanistan. Let’s inspect that soul a little more closely though. I’ve never been inclined to hold my tongue about the recently departed. Well, yes, in personal life, but certainly not public life—especially in the midst of one of these orchestrated rituals of national morning that have become so damned compuslory since Ronald Reagan went on to his reward. Sure, Teddy had his virtues, especially in contrast to his older brother John, who could wage imperialist war with the best of them, and who’s revered by supply siders as their political ancestor. (Since we’re talking politics, not personality, let’s bracket that little incident where Teddy drunkenly drove a woman to her death, left the scene of the crime, and then dispatched a family laywer to get to the Kopechne family before the press did. One can only imagine what went on at that meeting.) Let’s just look at Teddy’s role in one of the greatest assaults on working class living standards of the modern neoliberal era, transport deregulation. Once upon a time, working for an airline or driving a truck was a pretty good way to make a living without an advanced degree: union jobs with high pay and decent benefits. A major reason for that is that both industries were federally regulated, with competition kept to a minimum. Starting in the early 1970s, an odd coalition of right-wingers, mainstream economists, liberals, and consumer advocates (including Ralph Nader) began agitating for the deregulation of these industries. All agreed that competition would bring down prices and improve service. Among the leading agitators was Teddy Kennedy. The right has been noting this in their memorials for “The Lion,” but not the weepy left. Why was Kennedy such a passionate deregulator? Greg Tarpinian, former director of the Labor Research Association who went on to work for Baby Jimmy Hoffa, once speculated to me that it was because merchant capital always wants to reduce transport costs—the merchant in question being Teddy’s father, Bootlegger Joe. Maybe. And what was the result of all this deregulation? Massive downward mobility for workers. The Bureau of Labor Statistics doesn’t provide earnings data for the airline sector, and its data on trucking only begins in 1990. (Start search for data here.) So for a longer-term view, we have to look at the entire “transportation and warehousing” sector (which is mostly transportation). The graph of that sector’s hourly earnings compared to the entire private sector average is below. 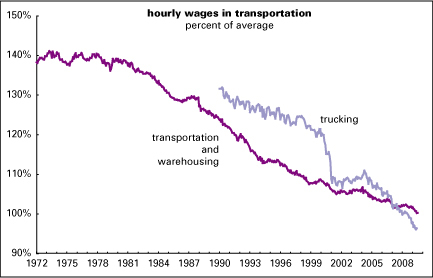 On the eve of dereg, hourly wages in transportation and warehousing were about 38% above average, where they had been for years. As soon as regulations were lifted, however, the averages began a long slide that continues to today. That wage premium has now disappeared completely. The pattern in trucking since the data begins in 1990 is pretty similar, going from a 32% premium in 1990 to a 4% discount today. And working conditions have gotten inexpressibly worse—longer hours, fewer benefits, less security. Perhaps there’s a perverse egalitarianism here, the dethronement of a labor aristocracy. Is that the soul of the Democratic party? Ah, but partisans will respond, dereg has lowered costs, democratizing the formerly elite world of air travel. (Most of us have little to do with trucking, so I’ll leave that aside.) Fares are purportedly way down now that competition rules. Proponents point to their favored measure, real costs per seat mile—the inflation adjusted cost to a passenger of traveling a single mile by air. Those are indeed way down—good news if you’re a seat. If you’re an actual human passenger, however, flying today is a whole lot more challenging than it once was—more advance purchase restrictions, fewer nonstop flights, more transfers. (The last two mean that people are flying greater distances to get from A to B than they did pre-1979, so citing fares per mile is ludicrous.) Those restrictions and other unpleasantries are actually a hidden form of price increase. The compilers of the Consumer Price Index try heroically to adjust for such quality declines. That’s why the airfare subindex of the CPI has been raced ahead of overall inflation since dereg hit in 1979. Graphed nearby are the two price indexes. Note that before deregulation, the lines moved in tandem. Since deregulation, airfares have taken off. The gap would be more impressive if it hadn’t been for the recent decline, a product of the collapse in oil prices in late 2008 and early 2009, compounded by weak demand thanks to the recession. 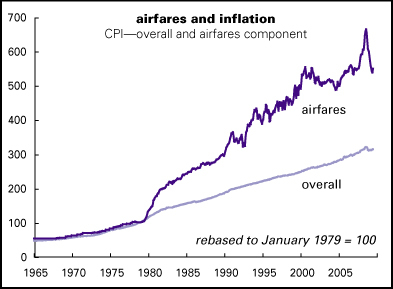 Since 1979, inflation in airfares has averaged 5.9% a year, vs. 3.8% for the overall CPI. From 1964, when the airfare subindex begins, to 1979, plane travel lagged overall inflation—an annual average of 4.4% for airfares, vs. 5.4% for the headline CPI. You might think that rising prices and falling wages have been good for industry. Not so for the airlines, which are now mostly a wreck. According to the Air Transport Association, the industry as a whole lost a cumulative $40 billion since 1979. That more than offsets the industry’s total profits between 1947 (when their figures begin) through 1978. In its entire history, the U.S. airline industry has lost a total of $35 billion. Many major names have been through bankruptcy, some more than once. “Good news if you’re a seat.” Nice phrase! Well, at least all the Kennedy brothers are dead now. I never could stand any of them. The NYT yesterday (August 29) had a pathetic story about Teddy and the Clarence Thomas hearings. Poor guy he had to sit mutely by while Thomas, one of the worst justices in recent memory, was confirmed because he had been involved in a personal scandal in Florida. Now there’s a man of real principle. Give me Lyndon Johnson any day. At least Johnson’s concerns for the poor weren’t totally fake like John’s and Bobby’s and Teddy’s. Major losses for capital? Maybe for non-insider shareholders and bondholders. Compiling the loot taken out by investment bankers, lawyers, insiders and related parasites from the airline industry since dereg would be a very interesting project. Good column, thank you. Btw, Louis Proyect seems to totally agree. It sure would be interesting to see how much the parasites took out. I recall that back in the late 1980s, in a failed takeover attempt against some airline (might have been Eastern, can’t remember), the bankers billed $70,000 per banker hour. On a failed deal! But what would $100,000 invested in a basket of airline stocks in 1979 be worth today? Close to nothing, I’m guessing. We are seeing the last of the unionized large LTL carriers (Yellow-Roadway, YRCW, employing 30,000 workers) now at the precipice of bankruptcy and workers bearing the brunt with wage cuts and pension contribution deferrals. Unlike in the single employer world, in the Teamster multi employer plans the remaining employers pick up the slack on pension contributions when other contributors go bankrupt. This has pushed hourly pension contribution rates to levels that are unsustainable on a competitive basis going forward given the low wages and absent benefits in the non-union sector. All of this the result of the deregulation that you describe — can only be addressed with a global solution to retirement security for American workers and a re-regulation of U.S. capitalism. The stark contrasts between the ideals of the Progressive movement and the right wing’s backwards and greedy ideology were out in public Saturday for all to compare and contrast at Our Lady of Perpetual Comfort Church in Boston. The differences were so obvious, you could not have missed them had you tried. Those Jesus loving Democrats are as capable of screwing the religious folks as the Jesus loving Republicans. Their track record speaks for itself. Indeed, read the article above where the Jesus loving Democrats screwed the truckers and airline workers.